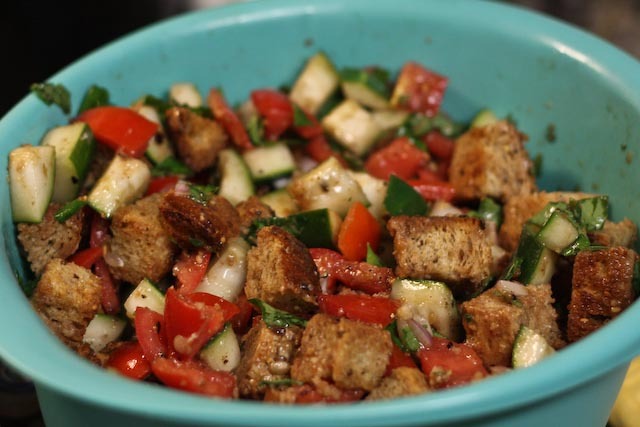 Panzanella: it all starts with a loaf of bread. Could be French bread, or a nice baguette. 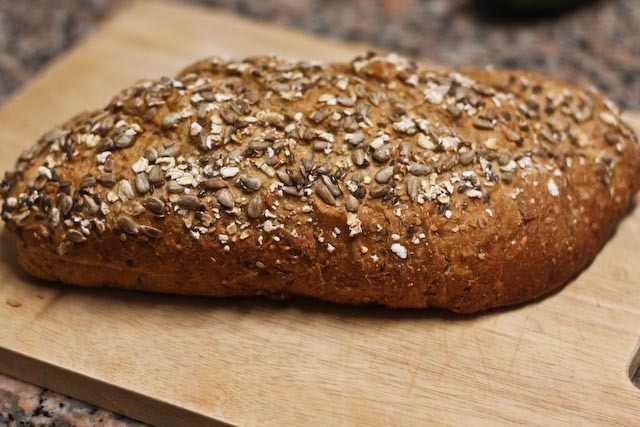 I used a very yummy-looking (and tasting) fresh loaf of whole grain bread. 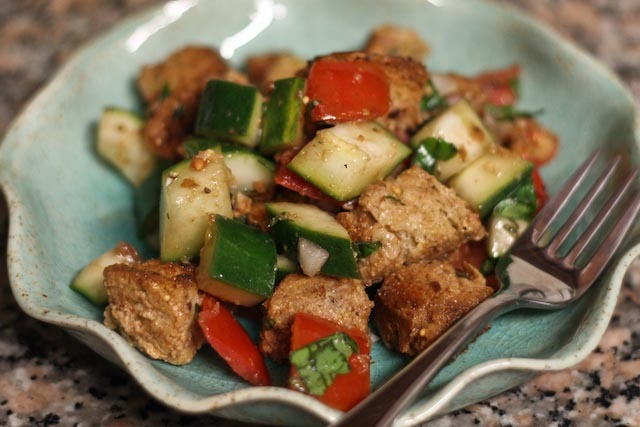 Panzanella originates in Florence, and traditionally is made of stale bread that is soaked. This a delicious way to use up leftover bread loaves from dinner parties or other recipes. 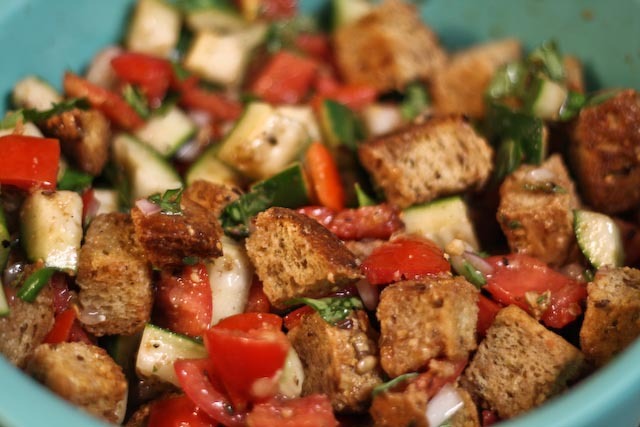 Or you can just buy a fresh loaf because you’re craving panzanella…like I did. 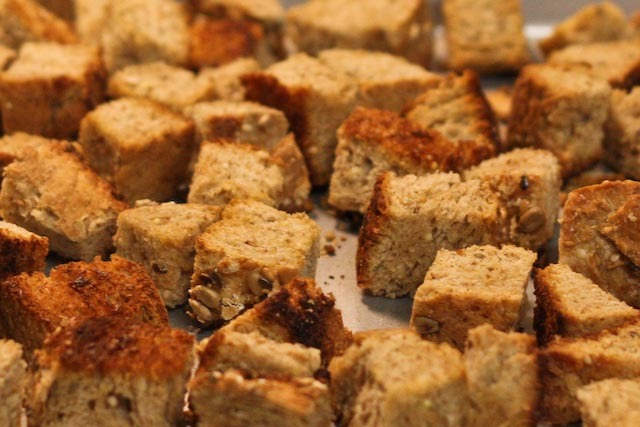 The bread is cubed for this recipe, into about 1″ pieces and then baked for about 15 minutes. It’s key to bake the bread pieces before mixing it with the rest of the salad ingredients to keep the bread from getting too soggy as it soaks up the flavors of the dressing. I chose you make this salad mainly with cucumbers and tomatoes, because they are in season here, and they happen to be some of my favorites. You could substitute other vegetables, as desired. I think I may try one later in the summer with corn, cilantro, onion and peppers. Yum! Also, feel free to peel the cucumber. I was lazy and I also happen to like the crunchy skin. I used fresh basil and thyme, but dried herbs would work well too. 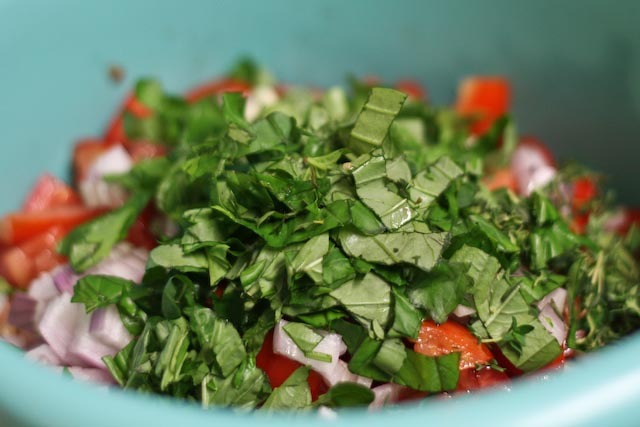 If you have fresh parsley on hand (I didn’t), it would also be a great addition. 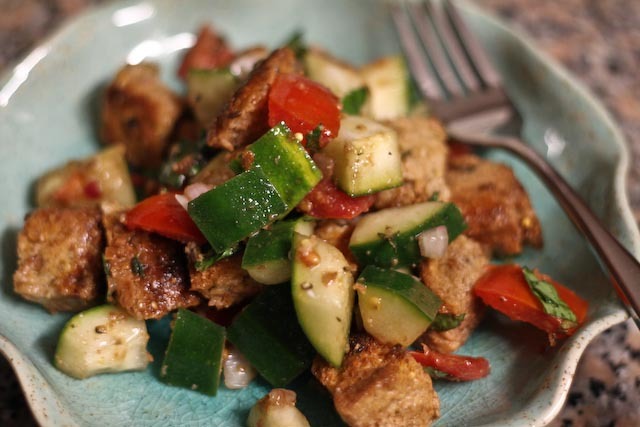 If you can, let the panzanella sit in the fridge, covered, for about an hour before serving, to allow the bread to absorb all of the delicious flavors in the salad. Preheat oven to 350°F. Please the bread cubes on a large baking sheet in a single layer (use more than one baking sheet, if necessary). Bake for about 15 minutes, tossing the bread once or twice along the way, until the bread is golden brown and the edges are crisp. Set bread aside and let cool. 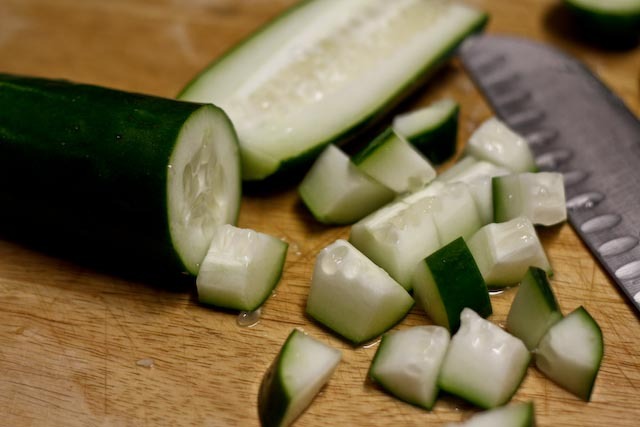 In a large bowl, combine the cucumbers. tomatoes, garlic, onion, basil and thyme. In a small bowl, whisk together the olive oil, balsamic vinegar, lemon juice, salt and pepper. Add the bread to the salad and toss. Drizzle with the dressing and toss to combine well. If the salad seems a bit dry, add more olive oil and lemon juice. Cover the bowl and refrigerate for at least an hour before serving. Toss again before serving. Serve chilled. Beautiful colors! It looks so fresh!